Instead, there are people who are very open about sharing both what they know (which is impressive) and what they don't know (which is more important). I've never been in a group where people are more uninhibited about saying, "Wait -- I don't get it." As a result, everything we do gets enriched by some extremely good discussion. When we don't have a formal presentation, we sometimes walk through a code project somebody's working on, or research a programming topic together (like dependency injection). Recently we've started publishing a simple programming problem and asking the members to bring a solution in their favorite language - reviewing the various solutions is a nice exercise in both language details and programming approaches. Come see us sometime. We meet the second Wednesday of the month at 7:00 PM at the Dayton Chess Club. Q. What's wrong with this message? A. The window that it pops up in doesn't support copy-and-paste (on Fedora 13, at least). If you want to websearch for this message, you have to type it in by hand. 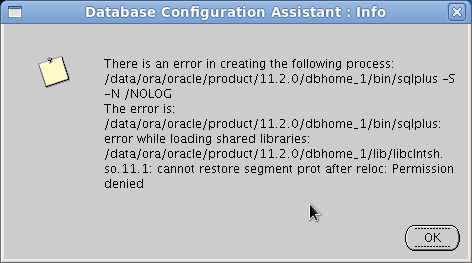 Hey, Oracle - fix it, please? It's the sort of usability problem that I wouldn't nag you about if you were a little FOSS project or a mom-and-pop software shop, but you're a big company with fifty bazillion programmers and entire committees on usability, so I know you can do it. I'm sure that's the fault of whatever Java GUI library underlies your graphical tools like dbca... so go on and fix the library, and the whole world will benefit! Q. What else is wrong? A. The workaround to this error is to disable SELinux. For the ultimate bestest securest database EVAR, doesn't that seem a little cheesy? A. Until you actually achieve SELinux compatibility, how about trapping the error with a message that describes the workaround? Failing that, mentioning in the Installation Guide that SELinux should be turned off is a next-best solution... no, come to think of it, forget I said that. "It's on page 732 of the docs" is actually a terrible excuse for leaving a bug unfixed. I don't know how "document it" became an acceptable alternative to "fix it". Q. Are you finished yet? A. Almost. 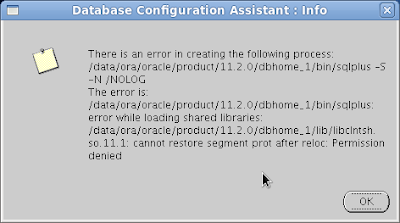 After more than 10 years of DBA work, I actually don't know what the proper channel is for making suggestions to Oracle Corp. I end up ranting about it on my blog, approximately the equivalent of wandering into the street and yelling about it. Is that silly or what? I'm Catherine Devlin, and I approved this message.